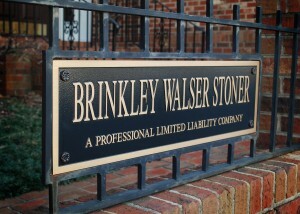 Brinkley Walser Stoner is a general practice firm headquartered in Lexington, NC, with offices in Greensboro. Our attorneys and staff are here to support your legal needs during every phase of your life. Practice areas include business law, estate planning (wills, trusts, advance directives), probate, elder law, Medicaid and Social Security disability, employment law, banking law, real estate law (contracts, closings), school law, family law (divorce, separation, custody, child support), municipal (government, airport) law, and more. The firm (and our team members) are dedicated to serving the community, giving back and participating in events on a regular basis. Our attorneys speak to community groups regularly to educate them on legal topics of interest. The firm was founded in 1886 and has operated continuously in Davidson County and surrounding areas since then. We are happy to be part of the community.